We are looking for a friendly and reliable person to join our team as ongoing part time receptionist cover. The position offers flexible hours each week, including some Saturday opportunities. As with all our positions, the most important thing for us is to find the perfect person for the role! We will give a lot of training in the role and there are opportunities to progress in the role. Reception experience not essential, however, a good grasp of basic computer programmes is essential as well as a good telephone manner and excellent time keeping. This would ideally suit someone who loves dealing with people and who is passionate about health and fitness! We are looking for an enthusiastic and dynamic personal trainer to join our team of health and fitness professionals. Applicants must have obtained diploma or similar level qualifications including a practical/class element. We will not consider applicants who have obtained solely online qualifications. We are looking for someone with sound exercise physiology knowledge, functional movement screening experience, a sporting background and a keen attitude to learn and work as part of a team. Hub is a health and performance centre not a gym. 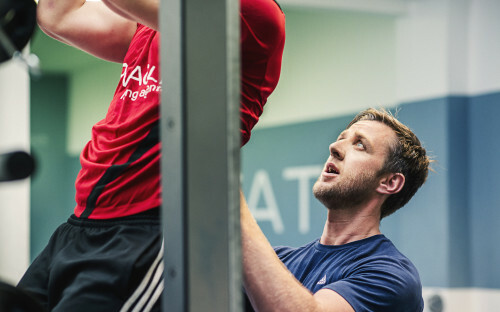 Within the centre we have an experienced team offering fitness and performance services such as 1:1 personal training, buddy training, small group classes, sports specific conditioning and rehab training as well as clinical professionals specialising in osteopathy, rehab, nutrition, sports massage and acupuncture. The position will include a 3 month probation period, with salary being a mix of commission and some hourly rate work. We would hope that this will lead into full time employment for the right candidate.